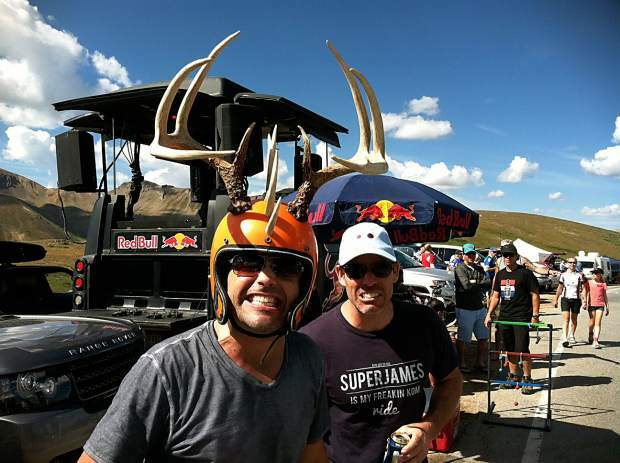 Several hundred people crowded the upper slopes of Independence Pass on Tuesday to dance, soak up suds in a beer bong, dress in costumes and — oh, yeah — cheer some of the best cyclists in the world. Officers with the Colorado State Patrol and the Pitkin County Sheriff’s Office said it was impossible to accurately gauge how many spectators showed up on the pass for the USA Pro Challenge. Stage 2 started in Aspen, climbed Independence Pass and then traveled through Buena Vista before cresting Hoosier Pass and ending in Breckenridge, 126 miles after the start. At least 300 people lined the road at the summit of the pass. Some dressed as superheroes (Wonder Woman and Gene Simmons, of Kiss fame, captured attention). Others just created goofy costumes (Vikings from Vail roamed the sideline, and a guy wearing a disco ball bellowed out cheers). The summit crowd was significantly less than in the inaugural year of 2011, when authorities estimated a crowd of 3,000. Camping at the summit was banned between mile markers 55 and 65 last year by the U.S. Forest Service, and the ban remained in place this year. The agency said the upper terrain needs protection from camping crowds. It was apparent while traveling up Independence Pass on Tuesday morning that spots were available in established Forest Service campgrounds. While the number of spectators was down from two years ago, the people who showed up were in a celebratory mood. Zach Frisch, an Aspen native who now lives in Denver, and his buddies pulled into a prime position at the summit in an oversized orange van roughly four hours before the racers arrived. Members of their crew sat on the top of the vehicle and invited friends and an occasional random passer-by to partake of their beer bong. Frisch said his crew has been there all three years of the Pro Challenge, which has climbed one side of Independence Pass or another each year. John and Jessica Withers, of Denver, stayed in Buena Vista on Monday night and drove to Independence Pass on Tuesday morning. They said they were among the first people along the summit. “We got here at 6 a.m. We could have been here at 7,” Jessica Withers said. They picked out a sweet spot west of the summit where the grade on Highway 82 is still a little steep, and they had a nice sight line. They were pleased with their parking spot and were chilling for hours before the racers reached the summit. Tuesday was their first trip to Independence Pass for the Pro Challenge. “On TV last year, this looked like the place to be,” John Withers said. Vehicles also filled every conceivable parking spot off the pavement along the final cut and steep grade up to the pass summit. That’s where the road is steepest, with a 6 percent grade. The parking spots were filled by 9:30 a.m. Spectators rang cowbells and called out encouragement to fans who were riding their bikes to the summit to watch the race. One such rider was Tom Willis, of Boulder. “We were here last year, and it was a great time,” he said. Willis said it was a treat to watch the racers from the pass but that it was also a special experience to ride the road without traffic. Highway 82 over Independence Pass was closed to vehicles between 9 a.m. and 2 p.m.
“It’s pretty cool to see that many bikes instead of cars,” he said. Several spectators arrived hours in advance and hung out at the top. Lisa Briner, of Vail, who wore Viking horns, camped at Difficult Campground east of Aspen and headed for the summit at 8:05 a.m. in the “Scooby-Doo Van” and cheered on cyclists that they passed on the road. She and her four companions danced to the rock music blaring from a Red Bull booth. Dancers even got several troopers with the Colorado State Patrol to join in during the mellow time of waiting for the racers to arrive. There were no arrests or problems with the crowd. After the event, a cyclist crashed while negotiating a curve about two miles west of Weller Campground. The man was lying on the highway, covered in blood, while authorities directed other cyclists around him. A steady stream of cyclists was snaking up the road at 8 a.m. Some arrived at the summit just minutes before course workers pushed spectators back to make way for the cyclists and race vehicles. Other riders picked places lower on the pass and then took advantage of the closure and rode up after the race. Even on the steep slopes that make mortal cyclists pay a brutal price, the top men’s cyclists cranked up at an astonishing speed. Most spectators just got a glimpse of the three breakaway riders, the peloton and stragglers as they whizzed by. For many of them, the glimpse made the experience worth it. “It’s the top,” beamed George Trantow, of Basalt, when asked why he and young son Tristan ventured to the summit. The steep grade — at an elevation the racers don’t reach in Europe — provided a “suffer-fest” even for the best cyclists in the world, he said. The suffering was evident on their faces, he added.